Academics have officially logged 421 terms – including "snaw" (snow), "sneesl" (to begin to rain or snow) and "skelf" (a large snowflake). The study by the University of Glasgow is part of a project to compile the first Historical Thesaurus of Scots, which is being published online. The research team have also appealed for people to send in their own words. Despite the source being BBC News, the article is only slightly misleading. The Historical Thesaurus of Scots does exist, and is a laudable project with both scholarly and popular cred, and the cited words for aspects of frozen precipitation are really in it. I was not able to find the "421 words for snow" in the online thesaurus — the link provided in the article leads to a search result with eight items, three of which are forms of "snaw", and offers further links to "Snow idioms" with six items, and "v(Snow/begin to snow)" with seven items, one of which is "snaw" again. There are some other snow-word subcategories indirectly available from the same page, like "Type of snow" (with two items), and "Snowball/action of thowing snowballs" (with four items, three of which are alternative spellings of snowball), but I didn't come near to 421 items (much less distinct "words") in a quick perusal of these links. But in any case, the usual Whorfian Words for X implication — that the Scots have subdivided the space of frozen-precipitation concepts especially finely, due to the pressures of their meteorological environment — is, as usual, not very well supported by the evidence provided. Excellent click bait, though. 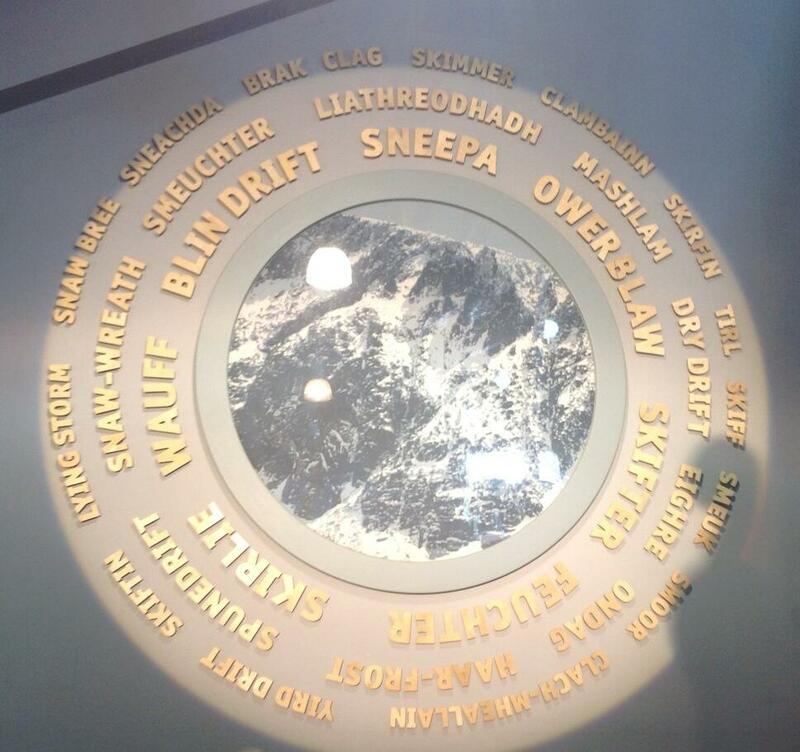 For an earlier discussion of related issues, see Stan Carey, "Scottish Words for Snow", Sentence First 8/27/2013, which includes this picture of an art installation that features "31 words and phrases […] from a glossary of ‘conditions of snow and ice in Scots, Gaelic, and travellers’ cant’". It is often said that the Inuit have 50 different words for snow. But at least it's reported as something that "is often said", rather than as a well-known fact. In my Ulster-Scots experience I've only heard of 'skelf' as a splinter of wood you get in your finger, so in the so sense there maybe the possibility of it being related to a 'skiff' of snow. Maybe 'sneesl' could be related to drizzle, like mizzle for misty drizzle, but the Online Etymology attestation for drizzle is possibly too late. [(myl) The Dictionary of the Scots Language has skelf n1 "A shelf in gen.; a framework or set of shelves; a ledge of stone, rock, etc. ", and also skelf n2, v "a thin flat fragment of slice, a flake; a splinter […] etc. The Dictionary of the Older Scottish Tongue agrees, with skelf n1 "A shelf", an and also skelf n2 "a splinter, a sharp fragment of wood, stone, or metal". How many words did sapir & whorf have for "Eskimo?" As John Ritson pointed out in alt.usage.english, if you just enter "snow" at the home page, you get 115 results, which is getting into the ballpark. [(myl) But take a look at the results. Storm(e occurs four times, Erd(d)rift occurs three times, Drift occurs twice, Yowdendrift occurs twice, Thow occurs twice, and in fact it seems that almost every item occurs at least twice; and the list ends with 25 "Category results"; so the number is more like something less than (115-25)/2 = 45… minus more generic terms like Weather and Storm, and pronunciation variants like Skiff, Skift, Skifter. So I reckon 35 lemmas or so is more like it, for the results of that search. This Guardian article references Geoff Pullum's debunkment of the Eskimo snow myth, although it then goes on to quote Dr Rennie as saying: "Weather has been a vital part of people’s lives in Scotland for centuries, […] The number and variety of words in the language show how important it was for our ancestors to communicate about the weather, which could so easily affect their livelihoods." MYL: There are 64 unique results of that search, which I present alphabetized to help you or anyone decide whether they're spelling or pronunciation variants. However, I doubt that the list of 421 words omits such variants. I didn't count "weather" or "storm" but I left in all the "snaw" and "drift" compounds. I agree that it's no longer getting into the ballpark. The list doesn't contain some of the words at the Guardian article Bas J linked to, such as "flindrikin" and "spitters". I don't know how you find those. "Flindrikin" is one of the words under "slight fall of snow/sleet", so I'd think a search for "snow" would turn it up. I'd guess that what this really shows is the amount of dialect variation in Scotland. The famous example of words for a strip of grass between the sidewalk and the street doesn't indicate how important "tree lawns" (the phrase in my dialect) are to Americans. In the Guardian article, after the discussion of words for snow, Alison Flood goes on to discuss marbles terms, one of which is "nieve" (a method of cheating). But "nieve" is Spanish for snow! Surely this means… absolutely nothing. Does this prove the Scots & Eskimos are related? Were aliens involved? Does this prove the Scots & Eskimos are related? Cf. Pokorny on the Robogdi of Ulster.